File photo courtesy Escondido Police. A driver died Sunday following a crash in Escondido that left him pinned under his truck, according to officials. The crash was reported around 9:35 a.m. at the intersection of Valley Parkway and Quince Street. A 41-year-old Escondido woman was behind the wheel of a 2003 Mercedes sedan headed westbound on Valley Parkway, while a 54-year-old Escondido man driving a 1996 Toyota Tacoma was traveling southbound on Quince Street, according to a report from Escondido Police Department Lt. Michael Kearney. “Both parties entered the intersection and a collision occurred,” the report stated. The force of the crash caused the Tacoma to roll several times and the man was partially ejected from the truck, which landed on top of him, according to the report. He was not wearing a seatbelt, the report added. Witnesses and an Escondido police officer were able to lift the Tacoma off the driver, but he later died from his injuries after being transported to Palomar Medical Center, according to the report. A woman was in the truck’s passenger seat and had to be extricated from the wreckage by paramedics. She was wearing a seatbelt and suffered only minor injuries, the report stated. The Mercedes hit a retaining wall, but the driver escaped injury. Alcohol was not a contributing factor, and the report did not state whether there was any fault in the crash but the intersection is controlled by traffic lights. 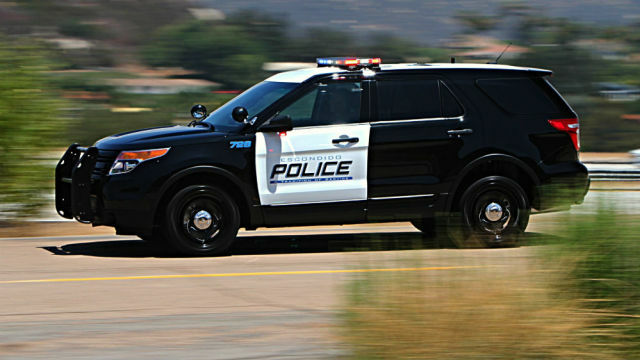 The incident remains under investigation by the Escondido Police Department. Anyone who witnessed the collision is asked to call Officer Russ Gay at (760) 839-4470.